Our all-girls summer program combines tech, entrepreneurship, and social activism, empowering the next generation of women in STEM. 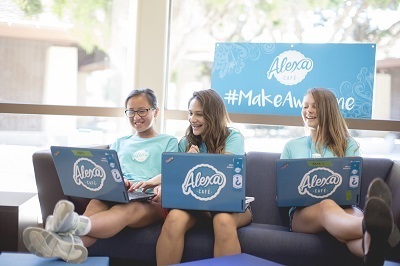 At Alexa Café, girls tap into the power of technology, exploring leadership, entrepreneurship, and social activism along the way. Ideas take shape around cafe tables in a fresh, empowering setting. New friends join forces and collaborate to better our world. 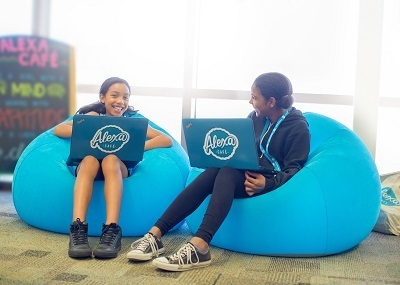 Whether your daughter wants to code an app for charity, design her own video game, engineer wearable electronics, or discover the secrets of cyber security, she'll create a project she's passionate about and join an inspired community of girls in STEM. With personalized instruction and an average of 8 students per instructor, this is anything but a typical classroom environment. We take the pressure off so your daughter can get straight to what matters—building a love of learning, collaborating with new friends, and bringing her final project to life with unabashed creativity. iD Tech also offers tech camps for ages 7-17 and teen-only academies. Get started today at www.idtech.com/alexa-cafe or call (888) 709-8324 for personalized course recommendations. Weeklong all-girls summer STEM program held at select campuses nationwide. Day Camps and Overnight Camps. For more details, specific weeks, and summer camp tuition information, click above to visit our website.